Florida School Psychologists are required to renewal their licenses biennially, on November 30th of odd-numbered years. 30 hours of continuing education are required to renew, 2 of which must be on preventing medical errors and 2 must pertain to domestic violence (every third renewal). Courses offered by APA-approved providers are accepted by the Florida Office of School Psychology and there is no limit on the number of courses that can be taken online. 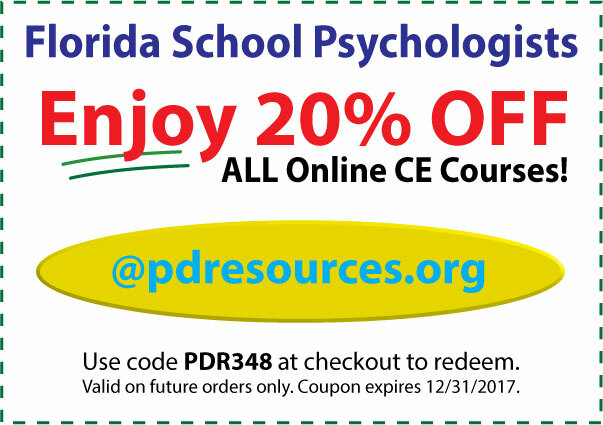 Click to view approved CE for Florida School Psychologists! There are about 700 licensed School Psychologists in the State of Florida. They perform such services as psychoeducational assessments, interpretation of aptitude and intelligence test results, prevention or amelioration of school adjustment problems, and counseling or consultation to students, parents and teachers. They are also trained to assist in the development and implementation of sound learning environments that facilitate the psychoeducational development of students. Florida School Psychologists are required – as part of their biennial state licensure renewal – to earn 30 hours of continuing education in areas that will enhance their knowledge and skills in their practice specialties. Of those 30 hours, two are required in the prevention of medical errors in behavioral health and two in the area of domestic violence. The latter is required before the end of every third renewal period, which – for most school psychologists – is on November 30, 2011. School psychologists are in a front-line position to detect the possibility of abuse in the children they see every day. Preventing Medical Errors in Behavioral Health is intended to increase clinicians’ awareness of the types of errors that can occur within mental health practice, how such errors damage clients, and numerous ways they can be prevented. Its emphasis is on areas within mental health practice that carry the potential for “medical” errors. Examples include improper diagnosis, breach of confidentiality, failure to maintain accurate clinical records, failure to comply with mandatory abuse reporting laws, inadequate assessment of potential for violence, and the failure to detect medical conditions presenting as psychiatric disorders (or vice-versa). It includes detailed plans for error reduction and prevention like root cause analysis, habitual attention to patient safety, and ethical and legal guidelines. The course includes numerous cases illustrations to help demonstrate common and not-so-common behavioral health errors and specific practices that can help clinicians become proactive in preventing them. Course #20-10B | 2010 | 31 pages | 15 posttest questions. Domestic Violence takes many forms; including child abuse and neglect, intimate partner violence, and elder maltreatment. Awareness of domestic violence is essential for all professionals involved in clinical care. Identification of domestic violence and appropriate referrals can result in significant and meaningful change, including both a reduction of personal suffering and a reduction of long-term costs to society in terms of health care, legal involvement, and lost productivity. Inappropriate responses, or lack of responses, may both result in considerable harm; therefore, clinician education is fundamental to ensuring that standards of care are consistently implemented across healthcare systems. This course begins with a definition of child abuse and neglect from the Centers for Disease Control and Prevention (CDC), followed by fact sheets with statistics and hotline referral numbers, information on assessment and referral, links to resource pages filled with a variety of essential tools for change, and Florida-specific information regarding mandated reporting. Course #20-48 | 2010 | 187 pages | 14 posttest questions. This course meets the Florida requirements for clinician continuing education in domestic violence identification, assessment, and referral. One of the company’s newest CE courses that will be of particular interest to school psychologists is “Reading in the Brain,” which provides a fascinating look into the brain processes that are used to identify words. It sheds a new light on dyslexia and helps clinicians develop effective literacy instruction. A second new course is “School Refusal Behavior: Children Who Can’t or Won’t Go to School.” School refusal is a problem that is stressful for children, for their families, and for school personnel. This course breaks down the distinction between truancy and a number of psychological disorders that may cause a child to refuse to go to school, providing interventions that work. Professional Development Resources is approved by the American Psychological Association (APA) to sponsor continuing education for psychologists. Professional Development Resources maintains responsibility for all programs and content. Professional Development Resources is also approved by the Florida Board of Psychology and Office of School Psychology (CE Broker Provider #50-1635). Courses are reported to CE Broker within one week of completion.